I've written three times before (1, 2, 3) about how the roundabouts in Zwolle cause danger for cyclists. Each time, I've pointed out that the use of the "priority" roundabout design in that city results in those roundabouts always featuring as the most dangerous sites for cyclists in the entire city. Zwolle according to the Gemeente. Three are roundabouts. 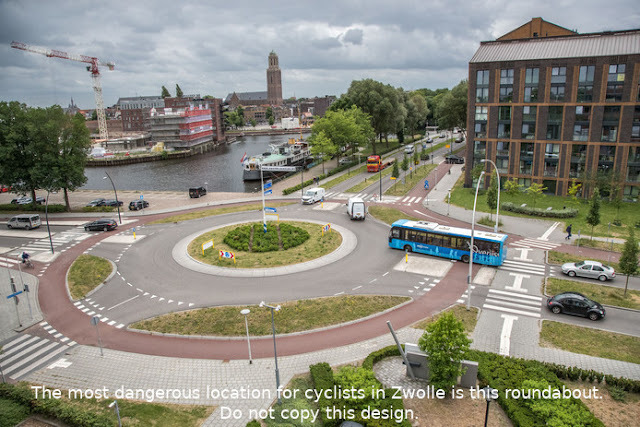 This has now been confirmed by the local government (Gemeente Zwolle) itself, which admits that the most dangerous place for cyclists in the city is the roundabout pictured above at the junction of the Burgemeester Roeienweg and Pannekoekendijk. Zwolle's local newspaper has covered this issue several times in the last year and this helped to prompt the local government to produce a top ten list of the most dangerous places in the city for cyclists. 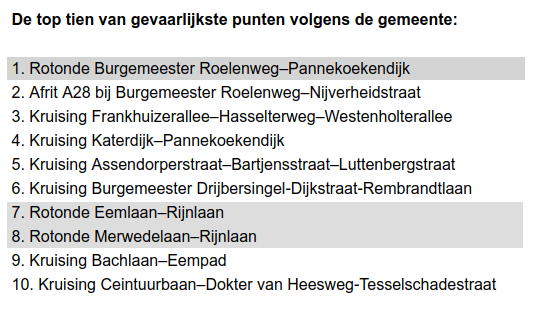 Gemeente Zwolle's top ten list shows that they consider three of the ten most dangerous places in the city for cyclists to be roundabouts. The top location is precisely the same roundabout as I identified as being the most dangerous in the city when I first wrote about the problem of adopting unsafe roundabout designs back in 2014. 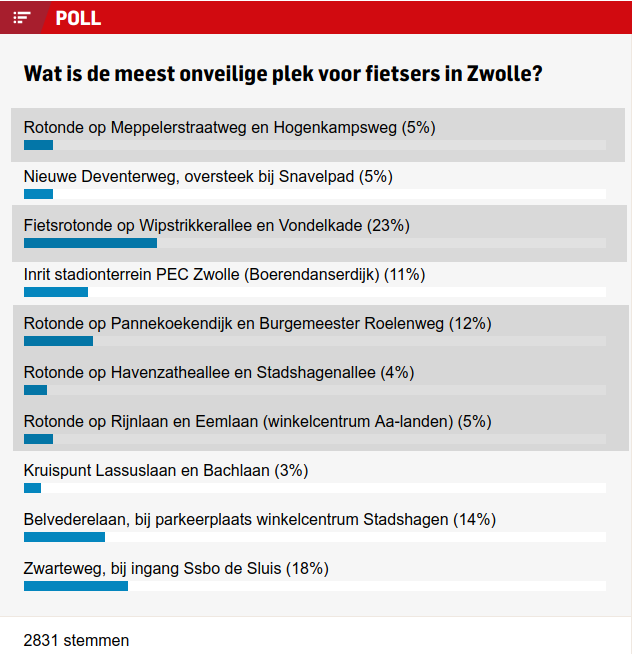 Zwolle according to newspaper readers: Five roundabouts. The newspaper also surveyed local cyclists who gave a subjective response about how unsafe various places in the city feel. They placed the most dangerous roundabout in fourth place and pointed out several other problematic roundabouts as causing a problem. 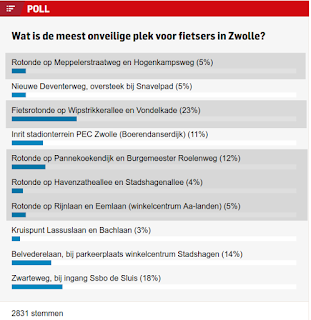 The worst place according to local cyclists is the "Fietsrotonde". The fietsrotonde opened in 2013 to claims of safety and much press coverage. Many people praised the new design but I did not because it was unproven. Instead, I pointed out in 2014 that the claims of safety for the fietsrotonde were premature, that I thought the design was confusing and that it gave little chance for recovery from error. A little later in 2014 I unfortunately had to update my blog post to point out that it had already claimed victims. to predict what each other will do. That is why it's unsafe. The subjective view of local cyclists that this junction is difficult to navigate safely is accurate and it results from the same problems as occur with the roundabouts in Zwolle: Cyclists must their "priority" by riding out in front of motor vehicles while relying upon drivers to maintain the safety of cyclists. This never feels safe and it never truly is safe. Drivers are frequently distracted, they often don't see cyclists until it is too late, and of course a fair number are simply not very skilled at driving so cyclists should never be expected to place their safety in the hands of drivers. When I wrote about Zwolle's roundabouts a second time (in 2015) it was as part of a blog post about the nature of the most dangerous locations for cyclists in several different Dutch cities. Amongst the most dangerous things that a cyclist or pedestrian can do in a modern city is crossing the road. At uncontrolled crossings our safety is very much in the hands of drivers and this is why uncontrolled crossings and junctions expose cyclists to great danger. 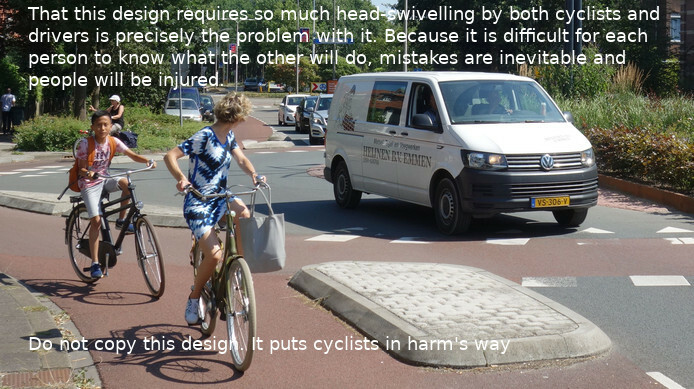 While the safe roundabout design which I have been promoting for the last four years almost completely eliminates this danger to cyclists using the roundabout, the unsafe roundabout design as used in Zwolle offers only a very small improvement over an uncontrolled junction (research found just an 11% difference). It should be no surprise therefore that when I went looking for the most dangerous locations in various cities, I found that cities which had adopted the safe roundabout design (like Assen) did not have roundabouts amongst their most dangerous locations for cyclists, while those cities which used the less safe design frequently had roundabouts as amongst their most dangerous locations. 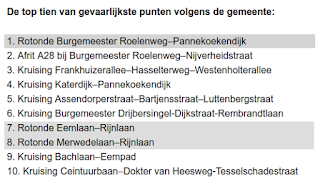 You'll note that Zwolle's local government listed many crossings (kruising) as well as roundabouts (rotonde) in their top ten list. If they had adopted the the safe design of roundabout then their list would probably not have included any roundabouts at all but instead would be made up almost entirely of crossings. Zwolle would have been safer for cyclists than it is. 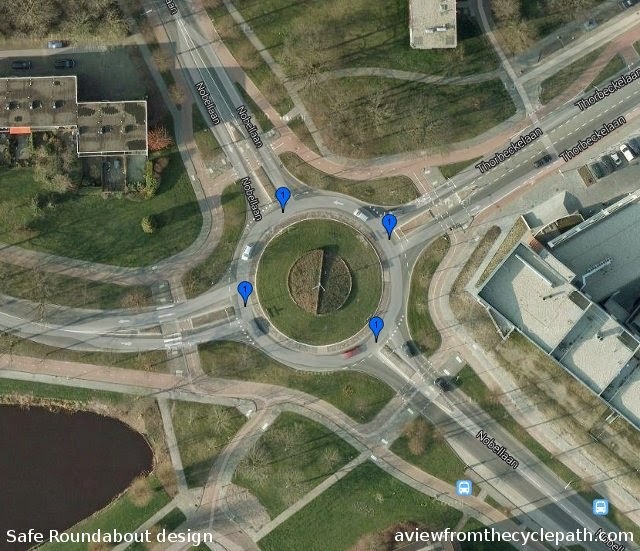 When I wrote about Zwolle's roundabouts in 2014, many people were quick to point out that the design of the roundabout was less than optimal. There was little distance between the cycle-path and the road. Claims were made that had this been otherwise, the roundabout would have been safe. We now know that this is not so. This particular roundabout has been changed in design quite radically yet it remains the most dangerous location in Zwolle for cyclists. Both photos show the same roundabout and this is the same location as at the top of the page. Safe roundabouts don't look like either of these two examples. Neither the "before" photo nor the "after" photo are safe. I pointed out that the first was the most dangerous roundabout in Zwolle in 2014 and Gemeente Zwolle themselves have now pointed out that the "improved" version of the roundabout remains the most dangerous location in the whole city for cyclists in 2018. Zwolle is now considering changing this design once more to try to make it safe. We should not keep making the same mistakes. There is a better alternative. This design is truly safe. Cyclists and drivers meet each other at 90 degrees so that sight lines are maximised. Speeds are reduced by camber on the road and the curves on the cycle-path so that both parties have as much time as possible to make decisions. Priority at the crossings is given to motorists because they have the greatest power to cause harm and the least "skin in the game". Cyclists are prioritized by having bidirectional cycle-paths so that they cross less often and because they can always turn right without considering motor vehicles at all. Please read the entire blog post from 2014 about why this particular design is special and watch a video which explains further. Dutch cities which use this design see radically fewer cyclist injuries on roundabouts than Dutch cities which adopt the same designs as used in Zwolle. I "re-read" you article on roundabouts. From what you said, and from the standpoint of my country (France), the conclusion I draw is that there are too many roundabouts at all (I'd say at least half), and that we have to revert to "good-ole" traffic lights junction...which isn't great either, really, as conflicts are at 90° angles. In France we have many many junctions which have been turned into roundabouts in the last 30 years, the most extreme examples can be found in Nantes, often whitout any cycle provision. How would you modify the "rond-point de Rennes" (which actually is a 'double roundabout'), with around 50.000 vehicles and 10.000 pedestrians per day ? Side question : I see that "CROW-based" roundabouts ('unsafe') examples you gave see the pedestrian and cycle crossings always 'at-grade', never on raised tables ; also the way that the annular desgign cause confusion, could it be revised to the type Assen use, in which a driver can predict if a cyclist is going to cross or not ? Otherwise thank you for your blog, I read it with great interest, alongside Mark Wagenbuur's.